FASHION FLASH! The BEST OF EVERYTHING In Beauty, Style, Health And More! SPRING 2014 EDITION! Barbara Hannah Grufferman from the Best Of Everything After 50 is hosting Fashion Flash this week. “I have the double honor of hosting FASHION FLASH this week AND welcoming a fantastic new woman to our fabulous group of experts! Debbi O’Shea, founder of the hugely popular site DivaDebbi, has joined FASHION FLASH, and will bring her brilliant POV about fashion and beauty to our weekly online mini-mag. We are thrilled to have her! Okay . . . back to biz! Aren’t you so so so glad that winter is almost over? Now that we’ve finally pushed the clocks ahead it’s starting to feel like Spring is truly around the corner. And that means it’s time for a bit of beauty, style and health spring cleaning! And what better way to kick off the season where hope springs eternal than by hanging with the FASHION FLASH experts? AND PLEASE, EVERYONE . . . IF YOU LIKE WHAT YOU SEE: READ, LIKE, AND SHARE. YAY! BlackCatPlus has opinions about Target’s plus size clothing. Fab Over Forty has tips on how to make your eyes look more youthful. NoNonsense explores a nutritional rock star. Fabulous After 40 shows you how to wear a dressed up version of sporty chic. Moving Free with Mirabai has etiquette tips. Aging Backwards went straight to the woman who ws born into etiquette. Prime Beauty shares secrets for her top 10 face, eye and lip primers. 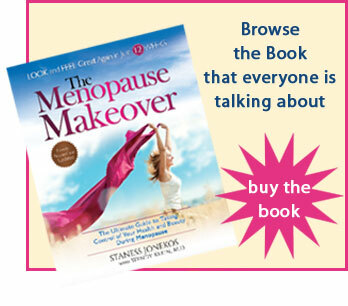 Staness from the Menopause Makeover shares her latest book, Eat Like a Woman, book trailer.